First poison control center opened in Chicago 1953. 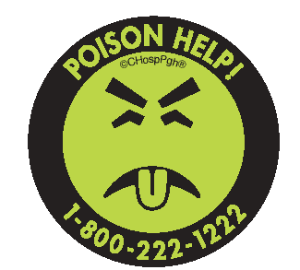 Second poison control center opened at Duke University, NC in 1954 and the third opens in Boston 1955. After World War II there was a proliferation of new drugs and chemicals in the marketplace, and consequently suicide and childhood poisonings from these agents drastically increased. Around this time up to half of all accidents in children were poisonings with a substantial number of fatalities. These factors led to the medical community developing a response to both unintentional and intentional poisonings. In Europe in the late 1940s special toxicology wards were set up, initial wards were started in Copenhagen and Budapest, and the Netherlands began a poison information service. In the USA the first poison information center was started in Chicago in 1953. By 1957 there were 17 poison control centers in the US, with the Chicago center serving as a model; these centers dealt mainly with physician enquiries by giving ingredient and toxicity information about products, along with treatment recommendations. Over time the poison control centers started taking calls from the general public. The majority of poison centers were not part of a patient treatment facility; they strictly provided information. In 1958 the American Association of Poison Control Centers (AAPCC) was founded to promote cooperation between poison centers in different cities and to standardize the operation of these centers. An additional part of the AAPCC's activities was poison prevention and education programs for both physicians and the general public. In 1968 the American Academy of Clinical Toxicologists (AACT) was established by a group of medical doctors. The AACT’s main objective was to apply principles of Toxicology to patient treatment and improve the standard of care on a national basis. In the 1960s and 1970s a rapid proliferation of poison centers emerged and by 1978 there were 661 centers in the USA. This trend reversed during the 1980s and 1990s with a number of centers closing or merging. In 2000 there were 51 certified centers in the USA. Today there are 61 centers operating. A similar movement evolved in Europe but unlike the American movement the majority were centralized toxicology treatment centers with integrated poison information centers. The French developed an inpatient unit for the treatment of poisoned patients in the late 1950s. In England the National Poison Information Service was developed at Guy's Hospital under Dr Roy Goulding. At around the same time Dr Henry Mathew started a poison treatment center in Edinburgh. In 1964 the European Association for Poison Control Centers was formed at Tours, France. Australasian centers were also established in the 1960s. The New Zealand center started in Dunedin in December 1964, while in Australia, the New South Wales Poisons Information Center was established in 1966.